Bank of Canton Branch Manager Kathie Ludecker (NMLS #458511, second from right) is joined by Simon C. Fireman Community residents Mary Bulman, Bobbie Cohen, and Jean Zech at the community’s recent Resident Council Meeting. Bank of Canton has provided residents with a weekly onsite banking program for over 18 years. CANTON, Mass. 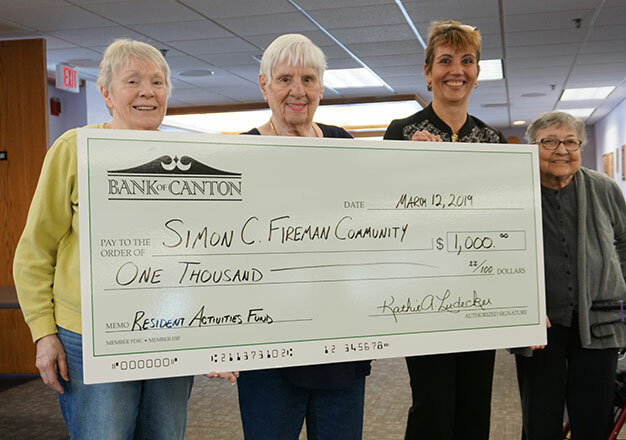 (March 20, 2019) – Bank of Canton recently donated $1,000 to Simon C. Fireman Community in Randolph to help fund resident activities. The bank is a longtime supporter and partner of Simon C. Fireman Community, providing residents with weekly onsite banking services for over 18 years. An affiliate of Hebrew Senior Life, Simon C. Fireman Community provides seniors with affordable housing with supportive services to ensure that they are able to live healthy, active, vibrant lives. For more information about Simon C. Fireman Community, visit http://www.hebrewseniorlife.org/simon-fireman-community.